Built by a sea captain in 1795, when fast American sailing ships brought exotic cargoes home from the Orient, Europe, and the Mediterranean, and the craftsman's skill created homes designed to delight the eye and last an eternity. The tang of salt air still lingers in Warren, and the authentically restored rooms of the Nathaniel Porter Inn provide guests with a welcome return to that gracious period in America's past. 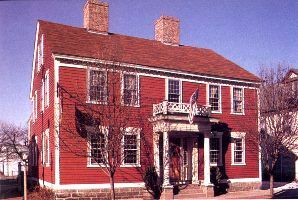 The Nathaniel Porter Inn combines the convenience and comfort of today with the unique charm of the past. -- The Bed and Breakfast is traditional New England at its very best! The Inn, listed on the National Register of Historic Places, has 3 comfortable bedrooms with private baths, all furnished with antiques, five separate dining areas and a triple***star restaurant to make your stay memorable. RATES: $80.00 room for two. $99 for room plus dinner for two. Open all year. Air conditioned. This and other Warren Rhode Island Bed and Breakfast Inns can be found here in The Register.